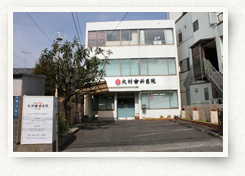 English speaking dental clinic in Aoi-ku, Shizuoka. 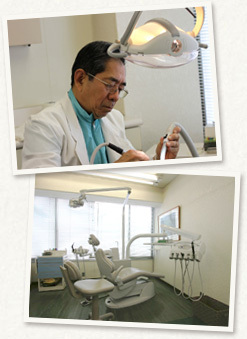 Omura Dental Clinic is one of the oldest and an English speaking dental clinic in Shizuoka area. We, as a primary care clinic, provide routine check-ups and cleaning, general treatment such as fillings, root canal treatment, crown and bridges, and dentures and Implant. Our goal is to provide the best dentistry available. “Best” means not only “the latest” but also “doctor’s extensive, full and comfortable care”. Have you already checked the photo of Dr. Omura? He looks like a typical stubborn old man! BUT, he treats you as if you were his own family member. Not only him, the staff members all have a certain friendship with our patients. We don’t know whether this is the right style as a dental clinic, but our clinic is a town dentist which has originally opened in 1946. We have close contact with neighbors and longtime patients. Our clinic is not a fancy hotel-type office, but a family inn–type office where you can feel close to the doctor and comfortable about getting dental treatment in your non-native country, Japan. I feel pain somewhere in my mouth but don’t know where! I haven’t been to a dentist for my general checkup since I moved to Japan. …anything is OK, please just contact us. We try our best to help you. Dr. Omura speaks adequate English, and his staff member, Ms. Tomomi, speaks perfect English and German as she has been in Europe and the U.S. for long time. Do you accept any private insurance? Basically yes. For further information and questions, please feel free to contact us. What are the costs of treatments? Our fees are based on the social/national health insurance medical fee payment set by the Japanese health insurance system. For further questions, please feel free to contact us. Basically, you need to pay your fee at your own expense. For further information and advice, please feel free to contact us. Yes, it is better. If you prefer morning hours (09:00-12:00), we highly recommend that you make a reservation in advance. How long does it take for the first time? We ask you to spend at least 1 hour with us because we first check your mouth condition and status. Get off the bus at Myokenshita bus station. Go straight along the street in the direction of bus travel, and turn left at the first corner. After walking about 80m, you will see our clinic on your right. *All busses of Miwa Oya line/Abe line stop at Myokenshita bus stop. Copyright(C)2013 - 大村歯科医院 All Rights Reserved.